Used Hummer Transmissions - Locate What You Need Fast at ASAP Motors. Please complete the following fields to receive bids for Hummer Transmissions! To begin receiving quotes on used Hummer transmissions, simply complete and submit the form above. Within minutes you’ll start seeing quotes from our network of reputable auto parts brokers. Hummer was a brand of trucks and SUVs from AM General that was sold to General Motors (GM) in 1998. GM produced the vehicles until 2010, when the impact of the economic downtown rendered the model inviable. Hummers generally came with automatic transmissions, though manuals were available in at least one model. The original Hummer HI was based on the military Humvee vehicle, while successive versions were based on smaller GM platforms designed for the civilian market. The brand also offered a smaller, two-door, off-road Hummer, a hybrid vehicle, a racing vehicle and a stretch limousine. Locating used Hummer transmissions has never been easier! Our unique Hummer transmission locator is fast, easy to use and gives you the power to search a vast network of used auto parts dealers all across America. Best of all, this helpful system is free with no obligation at all & can be accessed with just one form submission! Our nationwide network of automotive recycling facilities gives you the power to search countless possible sources for the transmission you’re looking for with the single click of a mouse. Just input your contact info and a description of the transmission you need. The system searches our extensive network to locate replacement Hummer transmissions. Vendors that have the part you need contact you directly via e-mail or phone, you choose how you’d like to be contacted. Just sit back and let the deals come streaming in. Just take a few moments to fill out the form and let our system initiate the search for you. You never have to leave the comfort of your own home to find the right Hummer transmission for sale. Are you seeking a GM TH400/3L80 three-speed, automatic transmission for your Hummer H1 or a five-speed manual transmission for your Hummer H3? No matter what you need, ASAP Motors has you covered. The Hummer’s roots can be traced back to military Jeeps of the 1940s and 1950s. 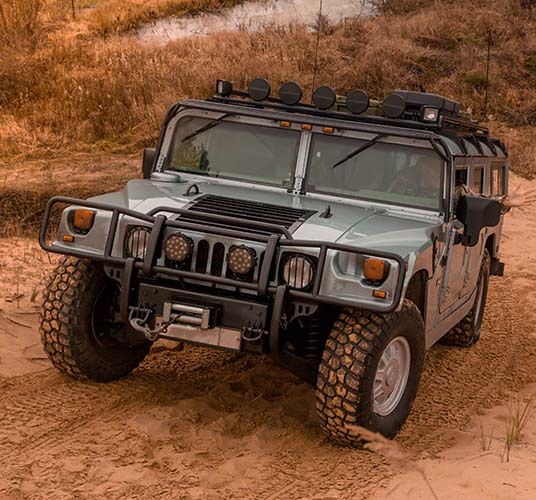 The original Hummer brand owner, AM General, was a spin-off of the Jeep Corporation, and designed a vehicle to compete for a U.S. Army contract in the 1980s – the Humvee. When GM introduced the Hummer in the 1990s, the vehicle maintained the boxy, wide appearance and bravado of the Humvee, but successive version became more civilian-oriented with cushier interiors and less Spartan dashboards. Hummers were available with three-, four-, five- and six-speed transmissions in both manual and automatic. Q: How much does a used Hummer transmission cost? A: While the price of your used Hummer transmission will depend on its year and model, most customers pay between $500 and $1,500 for used Hummer transmissions. Q: Will my used Hummer transmission come with a warranty? A: Perhaps. ASAP Motors does not sell used transmissions directly, so cannot make any guarantees about the final product. However, many of the used transmission brokers we partner with do offer warranties. We always recommend speaking at length with your broker about the used transmission’s mileage and performance, as well as any potential warranties. Make certain you have all necessary paperwork in order. Q: Who made Hummer transmissions? A: Hummer was a GM brand, and so most of the transmissions were made by GM. However, a few models contained transmissions made by Allison Transmission and the Japanese manufacturer, Aisin. The Hummer H1 was produced from 1992 through 2006. It came in both convertible and hardtop, as well as a two-door pickup and a four-door slantback. It shares much of its driveline features with the Humvee, including brakes, frame, axles and major body panels. The Hummer H1 used three-, four- and five-speed automatic transmissions. The Hummer H2 was produced from 2002 through 2009, and was actually built by original Hummer brand owner AM General under a contract with GM. In 2003, the H2 was nominated for the North American Truck of the Year award. It included perks like heated seats, a BOSE premium sound system and oversized tires. The Hummer H3 came with four- and six-speed automatic transmissions. The Hummer H3 was produced from 2006 through 2010. It was the smallest of all the Hummers, and available as a five-door SUV or a four-door pickup truck. The H3 earned mostly four- and five-star safety ratings from the National Highway Traffic Safety Administration & came in a four-speed, automatic transmission and a five-speed manual transmission.